This pair of silver brooches known as kerosang were used by Malay ladies to pin their baju (shirts) closed in the absence of buttons. They are typical Malay women’s kerosang – they are circular, slightly domed, pierced and decorated with applied silver flowers and foliage. The pair is notable because they are still attached to their original card with which they were sold. They have come from the estate of a former colonial administrator in Malaya. The backing card is stamped in blue ink with the words ‘Malayan Arts and Crafts Society / Kelantan Branch’. There was a strong tradition of Malay silverwork on the Malay Peninsula but by the early 20th century, the art of Malay silversmithing was in decline, so the local colonial administration sought to revive the craft among the Malays most notably in Kelantan. 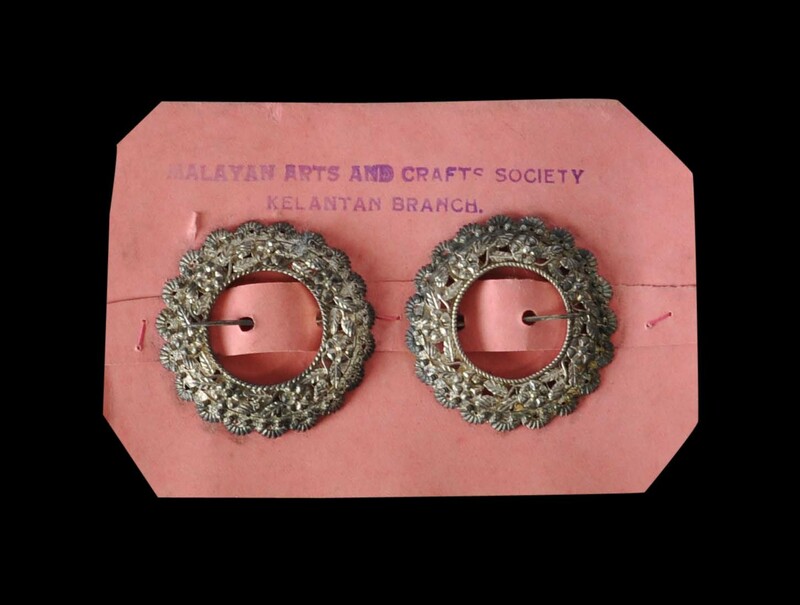 The Kelantan (Malay) Arts & Crafts Depot was established around 1930 to encourage local crafts such as silversmithing, and this pair of kerosang brooches is among the items the Depot handled. Other than light tarnishing, the brooches are in pristine condition. Kassim Haji Ali, M., Gold Jewellery and Ornaments in the Collection of Muzium Negara Malaysia, Muzium Negara Malaysia, 1988.